You’ve probably heard of The Princess and the Pea, but have you heard of The Prince and the Orange Blossom Cologne? Well, the “prince” is me , and though I love the scent of orange blossoms, especially on the tree, it’s been hard for me to find an orange blossom perfume that “sits comfortably” on my skin. I try orange blossom fragrances, one after the other, and think: “too syrupy sweet” “too spicy” “too light” “too feminine” “too powdery” “too sour” “too strident”…too too! Just in time for spring, John Varvatos is releasing Artisan — a new orange blossom-rich cologne that’s meant to evoke the aroma of pure, fresh, springtime air. * Artisan is Varvatos’ third men’s perfume, and he wanted Artisan to have a “lighter” aroma than his other two fragrances: John Varvatos and Vintage. I’ve spent many an hour in my kitchen slicing and squeezing basketfuls of oranges, clementines, and tangerines while making marmalades and jellies, and Artisan, as it opens, reminds me of that experience. The first minutes of Artisan’s development smell of orange peels and pulp — brisk, clean, and juicy. Then…Artisan utilizes a Benjamin Button approach, taking ‘oranges’ into reverse — going from mature fruit, to perfumed blossoms. Mixed into the aromas of oranges and orange blossoms is a green-herb accord (very ephemeral and smelling more of marjoram than anything else). After the green notes disappear, we’re left with the scents of orange blossoms and a stark, not too sweet, woody-amber aroma. Artisan’s floral notes never completely fade away — they are noticeable from start to finish and they are JUST RIGHT to my nose and on my skin. The “Prince” is finally satisfied and comfortable. When I got my first whiff of Artisan in the store, it was all I could do to restrain myself from an immediate purchase. (Always restrain yourself from a too-quick perfume purchase…unless you are smelling something hard to find in a place far, FAR from home.) Since leaving the store with several Artisan samples, I’ve worn the fragrance three times, and my first impression has held: Artisan’s a good quality, refreshing, spring-summery orange blossom cologne with perfect (subtle) warm-weather sillage and strength. * Women's Wear Daily, 1/23/09. ** Per Givaudan, serenolide is "an elegant white musk with sweet fruity connotations providing warm and soft velvety notes that blend well with all kinds of trendy fruity accords." 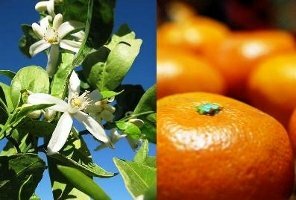 Note: images at top are Tangelo Blossoms (left), by squiddles at flickr; some rights reserved; and mandarin orange (right), by potaufeu at flickr; some rights reserved. Also, is the bottle as appealing in real life? The pictures make me swoon a bit. Katich: the bottle IS nice in person too…and a woman could easily wear this. This was already on my list (orange blossoms, cool bottle) but I think it will have to be moved up higher. Sounds pretty delish. Kevin – Thanks so much for the review! I love a good orange blossom, and also have troubles with them. I've spent a lot of years spritzing myself with high quality cooking waters! The two I have now are the Laura Mercier Neroli which I like for freshness but is a wee bit sweet and has a limoncello type accord, and Lorenzo Villoresi Dilmun. I think Dilmun is great with a very good ob note, but it doesn't have that fresh gardeny thing. I saw Artisan on Nordstrom website, and couldn't figure out what to make of it. Your review is *very* helpful. This one may be FB for me! I put orange blossom water in my scones rather than vanilla – really adds something a little different. Wow, this does sound quite nice, Kevin. Now I must find a Nordstroms for testing. One cannot have too many orange blossom colognes. I sometimes use lavender sugar in my scones or poundcake, that is a nice change too! It adds a floral note that is quite unusual. Bottle would/will look so nice on my dresser at the cottage! I just love reading when my friend K gets HYPE on a new fragrance! Look out Artisan…I'm hunting you down! This sounds quite lovely! I have yet to find an orange blossom fragrance which actually really works for me, so I'm intrigued and glad to hear a woman can wear it. Thanks for the review! jtc: I just need ONE perfect one, but don't get me started on ROSE perfumes…. platinum: why not?, we all buy fragrances for different occasions and places. C: but remember…you did NOT like Equipage! HA! Have you tried Armani Oranger Alhmambra? Speaking of cooking, there's a traditional Mexican sweet yeast bread that I love made with orange flower water. I think it would also be great in madeleines. “handwoven” that is, of course (I preview and still goof up). I also just noticed… that price point is EXCITING! I must say both previous Varvatos mens fragrances I did not like at all. But this sounds lovely and the bottle is very stylish (even though as a rule, I hate rattan anything). How would you compare this to the 'neroli' prominent designer releases from last year: Fahrenheit 32 and Fleur de Male? I have yet to dislike any fragrance JV has put out. Sounds like the trend will continue. Must. Stop. Hand. on. Credit Card. Great description, Kevin. Your words make this fragrance come alive and dance in my head. Made me want to get it, not just for the scent, but for that gorgeous bottle! I love orange blossom water in both coeur de la creme and creme brulee, although I think the lavender sugar is a must-try. C: the Alhambra deserves better…thought it was very boring. Joe: Thought the Armani/Alhambra was dull…my least favorite of the Prive's. Artisan is much simpler than the Hermes…and longer lasting…completely different to my nose. Artisan IS floral…but in an “Eau de Cologne” way…clear and fresh…like those blossoms on the trees you like so much. Joe: the pricing IS good; with that pricing and the larger-than-usual sizes, I was sure Artisan would be “fleeting” on skin. But the fragrance lasted on me a good 12 hours…it got “quiet” but I could always smell it myself. Mike: Artisan is less “dense” than the two you mention…I prefer it. quinncreative: HOLD BACK! Go. To. Nordstrom. First! Lavender is great in lemonade too…AND in lemon sorbet and ice cream. Hi Kevin, & thanks for the review! This sounds pretty. Speaking of lavender, I just looked up “lavandin” and see that it is a “hybrid lavender”. Do you pick up much lavender in the fragrance? I'm not too big on that note in big doses. The marjoram sounds delightful, though! Had lavender lemonade for the first time not too long ago – it was lovely. Also like it with ginger. Haunani…I didn't pick up on the lavender myself. tama: and let's not forget crushed, ripe/fresh strawberries in lemonade too! I REALLY want summer to get here…. All we need is a cup of rose-petal tea. Hi Kevin, interesting review as always. I love the bottle I think more than the potential of the scent, but I'll give it a try. I'm curious – my favourite orange based fragrance is Feu D'Orange by L'Occitane, which is deeply spicey yet beautifully fragrant orange at the same time, taking its scent from the blood oranges of Sicily. Have you tried that ever and how does it compare to Artisan? Well, the L'Artisan 2005 is pretty close to perfect, in my mind. I have also been on a rose kick, recently. (But you asked me not to get you started on rose, so I'll leave it at that. C: Neroli Portofino is a favorite of mine…. HDS: I like the opening of Feu d'Orange…and almost bought it based on that…thankfully I let the scent develop on my skin for a few hours and really hated the dry-down on me…it turned “meaty” on me! Hmmmmm. Orange? Not too much lavender? I see a run to Nordstrom in my future… maybe today. I share your princess/pea issue — too soapy, too sweet, too sour. This sounds perfect. BTW have you ever tried the l'Occitane one? Ruban Orange or something? It's not straight orange but it's very nice… not too expensive either. I think R reviewed it. Did this just pop up? Weird… I didn't see it. Anyway, the same thing happened to me! What is that all about?! Ugh. Many thanks, Kevin–sounds yummy, and I'm always looking for a good orange flower. I figure if this is for men, it won't be as floridly floral as some are. To chip in another recipe (I really like the scones idea! ), there is a funky recipe from southern France for green beans with a sauce featuring orange flower water . A completely different olfactory concept. . .
march: for some reason my L'Occitane never had Ruban Orange, d'Orange…whatevah…just the Feu/(“Whew!”/”EW!) one. Hi Joe. Nope…have not tried the Armani OA. I love citrus, orange blossom, neroli, etc…but my skin usually reacts like a sponge and longevity is almost always an issue. To be honost, the latest citrus I've tried and lasted a LONG time on me was Le Labo Tubereuse. It's mostly citrus with just a hint of tuberose. I sprayed it on my wrist at their shop at about 11 am or so….and smelled it well into the evening! I'm going to give this Varvatos a try though. I don't know about “meaty”, but I didn't like the drydown of Feu either. Ruban is okay, but I use it more for room spray (shh, don't tell Robin) than on myself. Also: If you're ever sampling Liz Zorn/Soivohle scents, her Moroccan Orange is REALLY nice. Citrus doesn't last long on my skin either. How about Fleur du Male? Does that last long for you? I don't love the scent, but it seems like it would have some staying power. Hello Kevin, the first paragraph sounds familiar… In my despair I splashed cooking orange flower water on my cardigan, and — despite smelling a bit like one of those air sprays people have on their toilet tank — I kind of liked it. For about one day, that is. I am wearing Habit Rouge EdT Légère a lot, above all in summer. I love it for (apart from that absolutely divine drydown) an orange flower note in the zingy citrus opening which makes it quite different from the lemony original. I think the bottle looks fantastic! Somehow recalls memories of my early childhood in the 70s creeping around rattan sofa tables over flockati rugs with Fleetwood Mac's 'Rumours' playing on the stereo. Lars: (A secret between us: one of my favorite EXERCISE CDs is by Stevie Nicks. HAHAHA!) The HR Eau Legere is strong on the orange blossom for sure…it's one of those TOO TOO O.B. scents for me…I have to be in the mood for that much O.B. to wear it…but when I do people love it. Kevin & others: I tried this in Nordies yesterday and it's fantastic! Lovely orange blossom without being cloying. 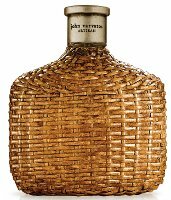 And the bottle is really nice (I didn't want to say anything before, but from the photo I just thought it looked like a tacky cheap wicker basket). I may really need to get this when it's out in 75ml. I know I keep going back to this, but the Varvatos is definitely more similar to the CdG Grapefruit than to Hermes Orange Verte. CdG perhaps a tad more “bitter.” Maybe I'm the only one who thinks CdG is more of a citrus/neroli scent than a true grapefruit like Balle de Match. Also, Kevin: I just have to say that I FINALLY got to try Chanel Allure Homme Edition Blanche yesterday and it is also fantastic! I couldn't stop smelling the test strip. I may need a decant of that this Spring! Joe: glad you had 100 percent success at Nordstrom. HA! I'm glad Chanel kept Edition Blanche “out and about”…I think it started life as a limited edition. Joe805 – thanks a little late for the extra comments on Artisan. Do you think a woman could wear this? Hey, I think it’s oerfectly suitable for women! In fact I use it – it reminds me a bit of Fico de Amalfi but iwth MUCH better lasting power. Hey, this is nice stuff! Verging on “too masculine” for me, but not quite over the fence. I quite like its citrusy top and fresh (fresh as in a wind blowing through, not calone-fresh) orange blossom. Lavender typically bothers me, but I haven’t gotten a headache from Artisan yet, so perhaps the synthetic lavender is a way for me to “do” lavender without landing myself with a migraine. I am impatiently waiting for Artisan to arrive, and have a feeling I’ll be stealing this from my husband. Poor guy. Tried this with eager anticipation after reading your review and unfortunately it’s a mixed bag for me. The fragrance starts off on me rich and syrupy sweet and extremely feminine – I don’t smell the fruit so much as the copious, heady orange blossom. Indeed on my skin it’s almost a high-pitched hum of orange blossom. My female colleagues like it; I am not so sure. The far drydown is quite lovely though, and the bottle’s gorgeous. Sincerest thanks for this recommendation. I tried it several times, bought a bottle, and have been loving it since as a daytime reminder of the coming spring months, and as a subtle, agreeable fragrance to wear at the office (where I have received compliments on the scent). On my skin, the orange opening is fabulous and energizing, and the drydown is very, very pleasant. On occasions, I get something of a “soapy” accord, probably where your marjoram note meets the sweeter orange blossom and light woodiness in the early stages of drydown, but it is by no means unpleasant. On the contrary, it really makes the Artisan exciting addition to my morning.